The public reaction to the alleged killing of Osama bin Laden has revealed once again the darker side of America, reminiscent of the response to 9/11 in 2001. Flags everywhere and national pride being displayed with an undeniable disturbing undertone glorifying murder and revenge. This video reminds me of a time in the past in Europe, where people were also blinded in an emotional high of nationalism. Despite the fact that the official story of the killing of the “biggest enemy of the free world” has just as many holes and questionable reports as the official story of 9/11 and that all the evidence leads to the high probability that Bin Laden has been dead for years, not many people seem to see anything wrong with glorifying the death of another human being. 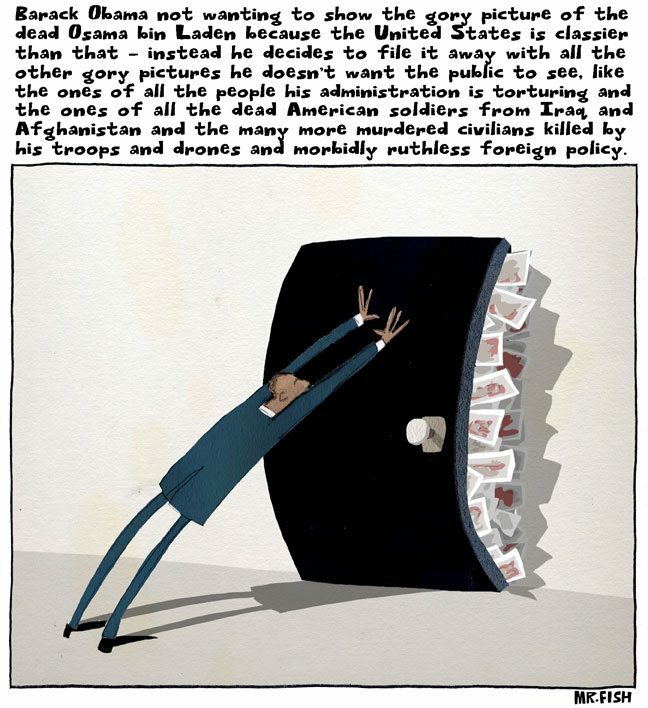 Millions of innocent people have died in the almost 10 year-long war on terror. Where are the voices for those voiceless, the ones that have suffered and died because of lies and American imperialism under the disguise of bringing “freedom” and “democracy”? The hero and man who will go into history as the president who hunted and killed Osama bin Laden, Barack Obama, decided not to show the picture of Bin Laden’s corpse in respect to the sensibilities of the American people since the pictures are apparently too gruesome, if they exist to begin with. I think (and it’s certainly not the most popular view), we need to see more of these images, regardless how graphic they are. Not for the sake of voyeurism, but to SEE what is really happening in the world, what this “great country” is doing to the people in other parts of the world in the name of “freedom” and the “war on terror”. Let us see the real images of millions of children and women killed, raped and mutilated in Iraq and Afghanistan. Let us see the pictures of the genocide happening in Palestine under the psychopathic apartheid state of Israel WITHOUT censor. Why not? There is death and blood on TV, video games and so-called entertainment. People pay for movies to see action, shooting, killing, gore and blood, but they get offended when they see it in real life and Obama is protecting us from a picture of an alleged killed “terrorist” because it’s too much? What hypocrisy! We need to see more of reality, more of what is really going on without getting distracted by filtered and fake news. It’s been almost ten years now and the 9/11 lie is still in place, a lie that has cost millions of innocent lives and the loss of freedom worldwide. How can that be? How quick would all the wars and terror end if people would truly SEE and REALIZE the suffering! This is life. And things will only get worse if we don’t start taking an honest look at the world as it is and ourselves as we are. With this Bin Laden scam we may have an opportunity to do the right thing. Maybe the PTB (Powers That Be) shot themselves in the foot with their conflicting stories, but if we keep silent they just keep going, bringing more misery to the world as the masses cheer them on. So, what are we really going to do about it? It’s really up to each one of us and all of us together for these are precious times. The truth won’t be seen or realized as long as we try to stay safe, in our comfort zone and just playing “nice” in order not to disturb our sensibilities, which ultimately only leads to complacency and conformity. It all comes down to 9/11 again and the fact that the official story doesn’t hold up at all, nor is Bin Laden the mastermind behind it. Osama bin Laden is just another chapter of “enemy creation” in the history of false flag attacks. You need a bogeyman to distract the masses and the announcement of his “capturing” and “killing” seems to be essentially a publicity stunt to kick off Obama’s election campaign and is merely a distraction from other issues affecting our world. It is a test for critical thinking beyond the herd mind of blind acceptance. On the other hand, it’s also not surprising how many people believe it and cheer “USA!” in blind nationalistic fashion. Hook, line and sinker. Very predictable. Like Plato’s allegory of the cave, people get distracted by the shadows on the wall as history keeps repeating itself. It seems like a long way to go in terms of “shift in consciousness” and it feels like the collective has taken a step back when looking at the public reaction to Bin Laden’s death. But there is always opportunity to wake up from the slumber and maybe this incident will not work for the PTB and may backfire on them, revealing the man behind the curtain. But as I said before, that depends on each one of us and if we make our voices heard. 4th of July seems to be a big deal here in the country of the brave. People pack out their stars and stripes, organize parties and barbecues, ignite fireworks, flags are being raised left and right. So what are people celebrating on the 4th of July? What are Americans so proud of? The general public thinks it is the Independence from England and the birth date of the “free country” called USA. Is that really so? Is the USA really independent and are its citizens free or is it merely a smokescreen for something else, a distraction to make the public believe and act in a certain way? And even if this would be the truth (the “Independence”), why would it be a reason to celebrate? Can we look at some little forgotten facts? This country was basically founded by privileged white men who stole the land, committing genocide on millions of Native Americans and most of them to this day live in reservations, forgotten, their culture raped, while the citizens watch fireworks in the horizon in celebration of the “birth” of this country? Something seems very wrong with this picture. But it’s not only the past, America’s empire conquests in the name of corporate capitalism, profit and ultimately greed has cost millions of deaths and suffering all over the globe. No other country in the world has started more wars than the USA. So how does the American public usually react to that on the 4th of July? By outrage, protest and standing up for truth and justice? Yes, some people with conscience and concern do stand up and say “no more!”, but unfortunately they are usually over-shadowed by the majority of brainwashed Americans who just do each year what they always do, waking up with a hang-over the next day after partying a bit too much in celebration of this country. “God Bless America!”. And we saw a taste of this blind nationalistic fever in the recent celebration over Bin Laden’s death. When will people come to their senses and stop cheering and waving their flags? All the romantic stories they tell people and kids about this “great” country in school, media and from”official” sources are mostly fiction and distorted facts in order to make people complacent and ignorant to what really happened and is actually going on. War means business. That’s why Roosevelt provoked Pearl Harbor to have an excuse to go to war. Same with the Inside job of 9/11, the CIA creation of Al Qaeda and the phony war on terror, America’s support for Israel and its genocide on the Palestinian people and so on. No soldier in this country is actually fighting for freedom or for the country, but for interests of a small psychopathic elite that sells the lie of patriotism and “honor”. The troops are being duped and die for lies, not for protecting or defending a “country”, nor for bringing “freedom” to another country. But this is done on purpose, and it is part of the” dumbing down” of America, the necessary social control to keep the sheep in the herd, satisfied with material comfort, so no one asks uncomfortable questions. And so the “dumbing down” continues until we make an effort to seek truth and act upon it. Sadly, many nice and honest people swallow the lies and can’t see their own conditioning. The whole Obama hype is a good example for that. Many well-meaning folks have put their hope into this guy and believed all the slogans of “change” and “unity” he uttered like a hypnotist, without really clearly seeing behind the smokescreen of this two-party system. That’s how the political system works, twisting reality in such a way to make people believe they have choice and freedom within the system, when in fact they have none. The best way to control a people is to make them believe they are free, while controlling their choices, behavior, desires, opinions and options through conditioning of official culture, the control of education, media, religion, science, history and economy. Control through force in the past became Mind Control as the people police each other and are not aware of the prison they’re in. Very true words. If people would realize that they have been living a lie for the majority of their lives, they wouldn’t know what to do. They rather deny it than face it. It’s like a psychological unconscious defense mechanisms to avoid truth, regardless of the facts presented. Let’s go deeper than just focusing on America, and look into the whole notion of belief in a country, nation and the question of patriotism, no matter what country you belong to or “identify” yourself with. Nothing changes when we just keep cutting the branches of the tree, for they will grow back. We need to tackle the root of the issue and the root is IDENTIFICATION and BELIEF. Sometimes I see a bumper sticker saying: “Peace is Patriotic”. I have to ask myself, who came up with that nonsense? Peace is not patriotic. Patriotism is a lie sold to the people, which we need to let go of if we really want to evolve to a better world. Countries don’t matter anymore, nor do flags. It’s all about global corporate interest under the guidance of psychopaths in power. The leaders know that, they just play the part they need to play to keep the herd in place. Any identification with a nation, flag or country fuels separation and hence conflict. All borders are man-made, based on outdated values and shortsighted ideologies that we as awake and aware people of this day and age need to let go of. We’re not Americans, Germans, Jews, Arabs or Chinese, we are human beings, are we not? You think this is impossible? It’s only impossible as along as you and I feed the illusion. Of course I’m not talking about a nation-less world under a totalitarian one world government, but a world based on higher values beyond control and fear. I know that this is a very idealist and Utopian idea when looking at the world objectively and I have my doubts if we ever see the return of a Golden Age. At this point it seems it has to get far worse before people wake up and anything close to a Golden Age is going to manifest. And maybe not all are even going to wake up for other reasons humanity is not aware of. Especially in this day and age, when we realize more and more how our beliefs and intentions affect the outside world, we need to be careful who and what we feed. 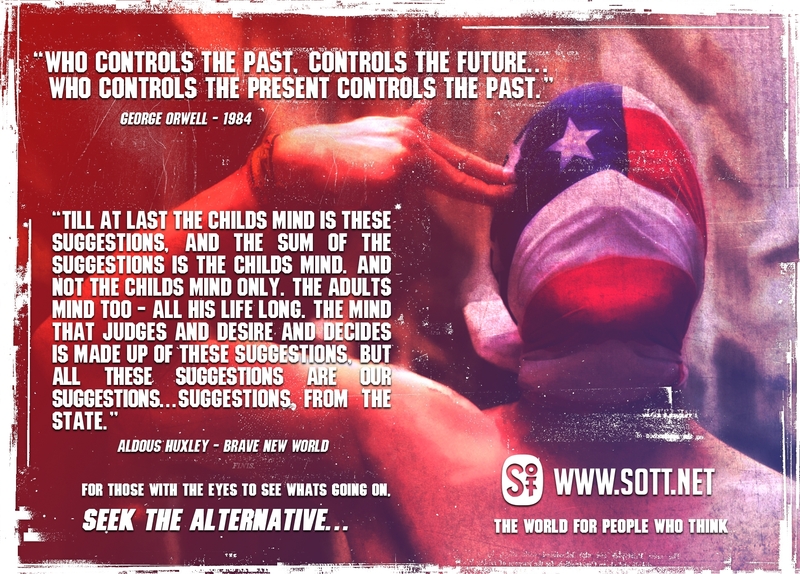 As long as we believe in lies or follow the lies told to us through politicians, media, religion and government controlled education, we will create more and more conflict and misery, no matter what we wishfully think to be, visualize or otherwise, regardless of our well-meaning intentions. Before we can “change” anything we need to see clearly the world not as we like it to be, but as it is, without rose-colored glasses on and that entails questioning our long-held beliefs. The question of national Identification, the absurdity or patriotism and worship of a flag is becoming more and more absurd. No one, no leader, no government, no army, no guru, is going to change the world unless we fundamentally change ourselves and act upon it. The emphasis is on FUNDAMENTALLY, not just avoidance and trying to be politically correct or retreating to some very questionable New Age “Teachings” to create the “reality” we desire in our subjective tunnel vision. This goes beyond re-decorating the prison cell (a.k.a. voting) or just focusing on ourselves without looking at what is happening in the world and the crimes committed in this country by its own government. There is too much at stake in this day and age and I’m not sure if people actually realize the great danger we are in. I suggest looking at this whole Bin Laden frenzy in a different light, and see how we’re being manipulated through nationalistic and patriotic identification, so we can break down the walls of this prison we’ve put ourselves in. “The nationalist is a curse because through his very nationalistic, patriotic spirit, he is creating a wall of isolation. He is so identified with his country that he builds a wall against another. What happens when you build a wall against something? That something is constantly beating against your wall. When you resist something, the very resistance indicates that you are in conflict with the other. So nationalism, which is a process of isolation, which is the outcome of the search for power, cannot bring about peace in the world. The man who is a nationalist and talks of brotherhood is telling a lie; he is living in a state of contradiction. Share on your social media!